LOOK WHAT WE GOT FOR THANKSGIVING! When Stephanie had Cati (I used to have an entry about that day; must have been eaten by blog moths), it was total chaos. No one was prepared because she came a whole month early. 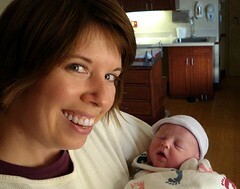 There was a franticness about Cati's birth, not on Steph's part. She was cool as a cucumber. But the rest of us turned into whirling dervishes. But they say each pregnancy and baby is different. William Lucas McGee entered our lives this morning without all the Lucy and Ethel moments that accompanied his older sister's birth. He's perfect. I guess I'm getting sappy in my old age, but his sweet little face made my Grinchy heart swell three sizes. Don't misunderstand. I'm not rushing home to throw the birth-control pills down the toilet. I'm just saying that I appreciate the miracle. And when that miracle happens to a friend you love like family, well...then it's all the more sweet and spectacular. Welcome come to our crazy little world Luke.